Kenny and his brother Nicky – our narrator - are ranking the world’s dirtiest words. “‘[Sod is] one of the worst words there is,’ Kenny told me. ‘Even saying it gets you a million years in hell. A sod is a man who digs up dead bodies to have it off with.’” Nicky queries this, but Kenny has the last word: “‘And a daft sod is one who forgets his spade.’” Barrington Stoke are earning a reputation for publishing short fiction appealing to readers whose interests may be in advance of their reading abilities. 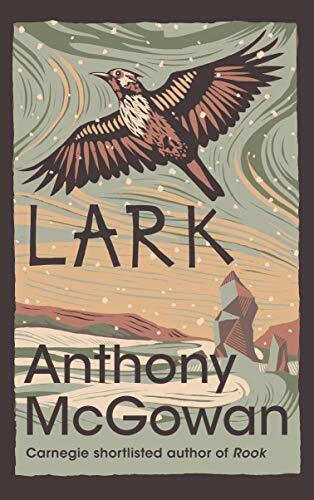 Maybe the publishers would cite the brothers’ conversation above to support their claim that Lark has a Reading Age of 9, while its Interest Level is 13+; where school librarians might shelve a book involving grave-robbers having it off with corpses is another question. The boys’ discussion of dirty words is no more than a distraction. They’re lost in the wind and snow on the Yorkshire moors; it’s getting colder and darker, their mobile can’t get a signal, they haven’t got the right kit, and they’re scared. The many readers who have followed the boys’ adventures through Brock, Pike and Carnegie short-listed Rook are used to the brothers getting into this kind of a fix. As Lark begins, things are okay at home, though Nicky and Sarah, the girl he met in Rook, are no longer an item. Nicky continues to look out for the amiable Kenny, who has special needs. Dad’s happily settled with nice Jenny, who sorted out the family’s domestic chaos of the earlier stories. The big moment they are all waiting for is the arrival of Mum from Canada to see her sons for the first time since she walked out in Brock. This novella brings the boys’ story to an end, and it does so in a way that may well surprise and move readers. It is good to learn that the first three books are now available in a single 380 page volume from Barrington Stoke, The Truth of Things.